Dozer isn't getting fixed or put down, relax. dozer isn't getting fixed or put down, relax., originally uploaded by caffeina. aw!, originally uploaded by caffeina. My gosh, look at those eyes! He was naughty and feisty at the vet. No lollipops 4 Dozers. He'll be fine and much happier once he gets his toothy extraction and the naughtiness-cessation-balm is applied. He's got you all thoroughly pwned! I couldn't have been the only person thinking it. He looked so betrayed and miserable... He's been in hiding all day. Poor kitty. Is it hard to get him in there too? That was always one thing Ophelia was good about. 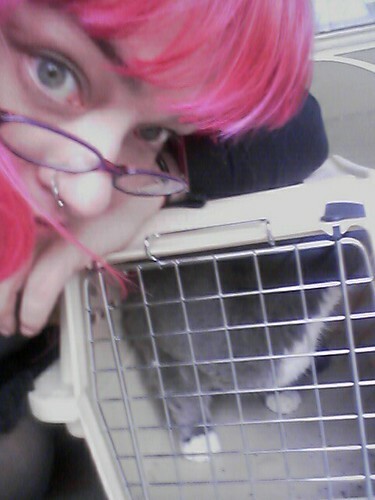 She was hardly ever in her carrier, but it just never phased her. She would just lie in it like it was nothing. 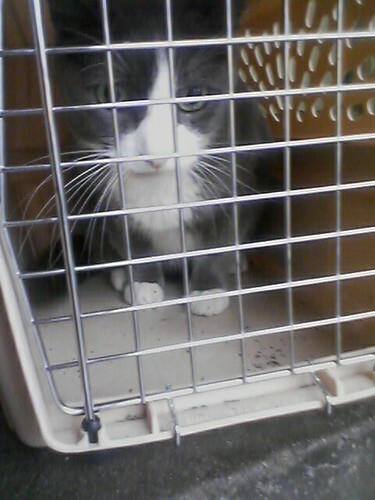 Nah it was pretty chill getting him in the carrier, we dusted the joint with catnip, aw yeah.